About Jason A. Lewis Jr.
Obama’s Health Care Plan have been call by the Republicans as “Obama Care,” as if that is a negative. With this bill 30 million uninsured or under insured citizens will be able to enroll in a Health plan. That’s a positive . I would like to clarify that misinformation about the mandate of this health care bill. By going to the Constitution. This health care bill was using Interstate Commerce Clause as a way to collect a penalty for the mandate of this bill. Since health care is not a commodity. It made this mandate unconstitutional for the Federal Government to collect money for this mandate as a commodity. John Roberts, of the Supreme Court remove ‘commerce’ from this Health Care Bill and replace it with a ‘tax’, which made this bill constitutional. Republicans call this raising taxes on Americans Citizens. Even though this mandate is a charge for personal Health Care Reform. Therefore this is not a tax. This mandate is a penalty for those who choose not to enroll in a Health Care Plan. And this mandate is collected under the Federal Government Tax Code. For those who refer to this mandate as a tax. This is misinformation and is only about political gain for the republican party base. And pay their donors, (big money), for their campaign money. This is an example of bad government, which is not good for the people. people by the people and, for the people. I would like to ask the republicans. Where is their respect for the Federal Government and, its people? Which they took an oath to defend and, uphold the constitution. You can only serve the people under a united congress. Those GOP members who speak of repealing the Health Care Bill. This repeal is base on their assessment of the cost of the health care bill, which they are projecting hypothetical dollars as a short-term cost. But lack the reductions of the over all cost in the long-term health care plan. You can’t project that cost of the Affordable Care Act before it go into full effect in 2014-2015 and beyond. Those who speak of repeal, don’t have a replacement of a Health Care Bill. They only have sound bites, and want to repeal this bill because it has Obama’s, name attached to it. Without any solutions for the uninsured or the under-insured. As in the Health Care Bill. The GOP members have voted 50 times to repeal the Affordable Care Act. These are symbolic votes against Obama as president. And for this they are willing to shut down the government unless President Obama, sign a bill to repeal the Affordable Care Act. These GOP members have said, “we are willing to hold the U.S. Budget hostage.” And not pay any of the government bills until President Obama, sign a bill to de-fund the Affordable Care Act. This law is now part of the U.S. Constitution. To de-fund the U.S. Constitution the United State of America would go into default and fall into economic collapse. Whoever would propose such insanity is Un-American and Anti-Government. These GOP Members claim they want to take back their government. Going back to 1801-1809 in the days of President Thomas Jefferson, no political party has ever own the United States Government. The U.S. Government belong to the citizens of America. And the citizens of the U.S.A. elected congress to administrator the people’s government. This is their code words for taking over the government from U.S. Citizens. And create a totalitarian nation. Imposing a form of government in which the political authority exercises absolute and centralized control over all aspects of life. How are they going to do this; you may ask? By suppressing all that would vote against their personal agenda. And by gerrymandering their local electoral districts. Drawing lines that would exclude democratic electoral voters. Why are they doing this? As a campaign against Obama, as President of the United States. This nation has tried to get a health care plan, going back to 1900-1909 of President Teddy Roosevelt’s, Administration. It has taken 100 years to get this health bill pass by congress. It may not be perfect, but it is a foundation to work out any problems that may arise in this health care law, by congress. To repeal this law now may take another 100 years to pass a new law for health care. The Republican Governor of Florida has refuse his citizens Obama’s Health Care Plan. And because of this six of his citizens are dying every day. There twenty-six other state governors who have refuse their citizens this health care also. There was a 36-year-old woman in the state of Florida. With a heart problem. She is a single mom with 3 children. Her medication for her heart cost $350 a month. With Obama-Care that same medicine would cost $35.00 a month. She had a minimum wage job. Like any mom she took that $350 to feed and take of her children. And she die because her government deny her the access to Obama-Care for her heart problem. They have condemn their citizens to death because, these governors hate Obama, as president. This could be your father, mother, grandfather, grandmother, or even your child. And these governors are playing politics with these people lives. You need to re-register as an independent voter because, these republicans governors have a disregard for life. And you can vote for the person and, not the party. You can vote these governors out of office. President Obama, is giving back tax dollars to the states that accept the Affordable Care Act aka, “Obama-care.” If your governor refuse the ACA. Some of your tax dollars is going to the states that accept the ACA. And you are penalized for not enrolling in a health insurance plan. This penalty will be deducted from your income tax refund. You only have your governor to blame. 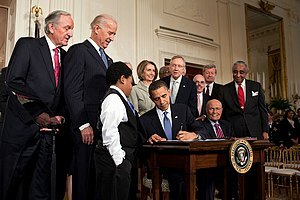 The ACA bill was sign into law by President Obama, and, now is the law of the land. And as a citizen of the U.S. you are allowed to enroll into a health insurance plan of your choice. But your governor has to sign this law into your state. If not you are deny this part of the U.S. Constitution. These republican members of congress that voted 50 time to repeal “Obama-Care”,( ACA). Really wanted to destroy the United State Constitution and, take away your democracy. As in your health and, welfare for future generations of Americans. They are not able to represent you as a citizen, while representing the Health Insurance Companies. And you are paying these members of congress six-figure salaries. Joni Ernst, a republican from the state Iowa. She is campaigning for a congressional seat in Washington D.C. Her clam to fame is that she castrate hogs. If elected she would castrate the ACA. By nullification. Here we go again, another republican repeal “Obama-care.” This is what happen when politicians and governors are motivate by hate. “Obama-care” is the code word for the hatred of Obama, as president. So when you go to vote. Don’t be motivated by hate, because it is self-destructive. And lets keep Joni Erst, on the hog farm. Because there aren’t have any hogs in Congress. If you are enrolled in a Health Insurance Plan in your state your premium have declined by 5% in the first 9 months after President Obama, sign the ACA into the U.S. Constitution. That decrease would be greater if all of republicans governors had signed the ACA into their State Constitution. These republicans politicians are more in interested in their own personal agenda. And not about your health and welfare. This would leave 30 million citizens without Obama’s Health Care Plan. If republicans repeal the ACA, aka Obama-care. I am a retired telephone installer & repairman for 30 years. Serve two years in the U.S Army. Worked in a hospital as a member of a surgical team. Never thought much about politic in the pass. With this political year so negative. It's time that every citizen need to be inform about who is in office and who wants to be in office. This entry was posted in Affordable Care Act and tagged Barack Obama, constitution, Health Care Plan, Health Care Reform, obama-care, People of the United States, the Supreme Court, U.S. Government. Bookmark the permalink.